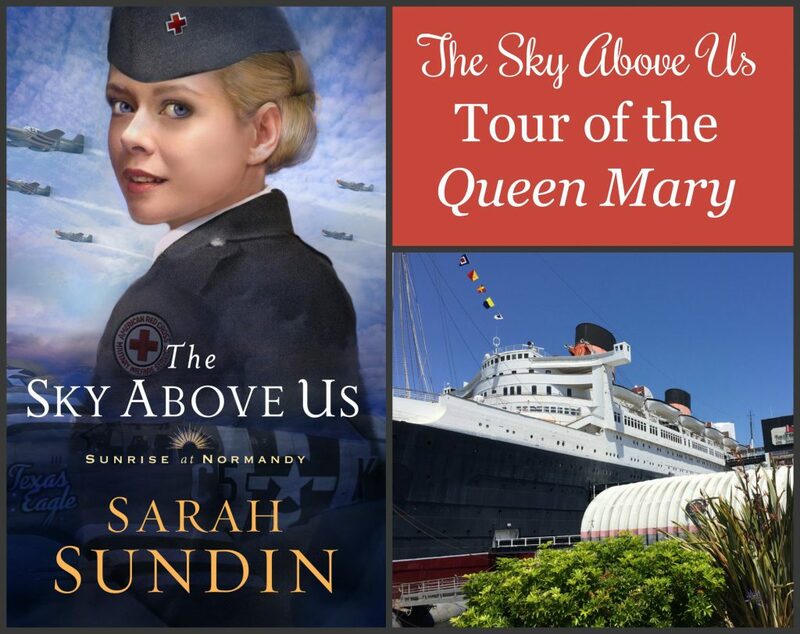 In The Sky Above Us, American Red Cross worker Violet Lindstrom and US fighter pilot Adler Paxton meet while waiting to board the troopship HMT Queen Elizabeth, and they get to know each other—a bit!—on board. 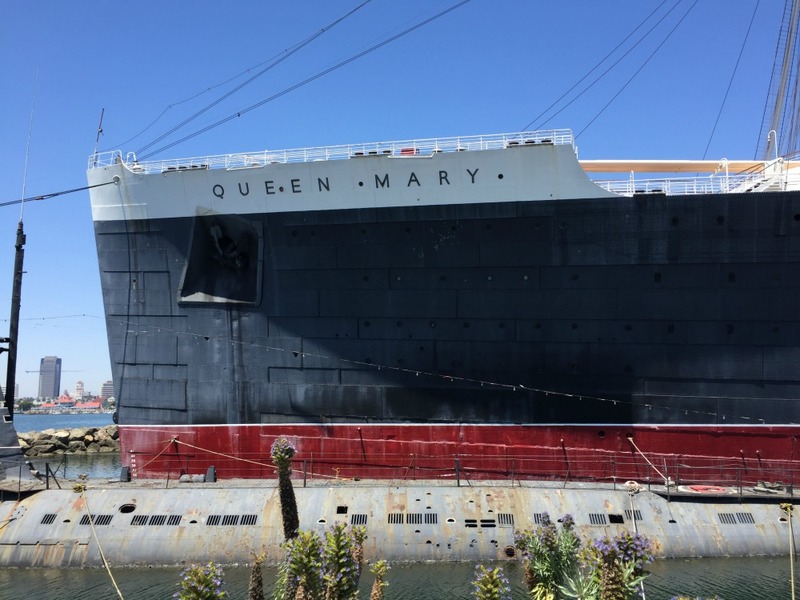 The Queen Elizabeth is no longer with us—the ship caught fire in 1972 and was scrapped, but the Queen Mary is a popular tourist spot in Long Beach, CA. 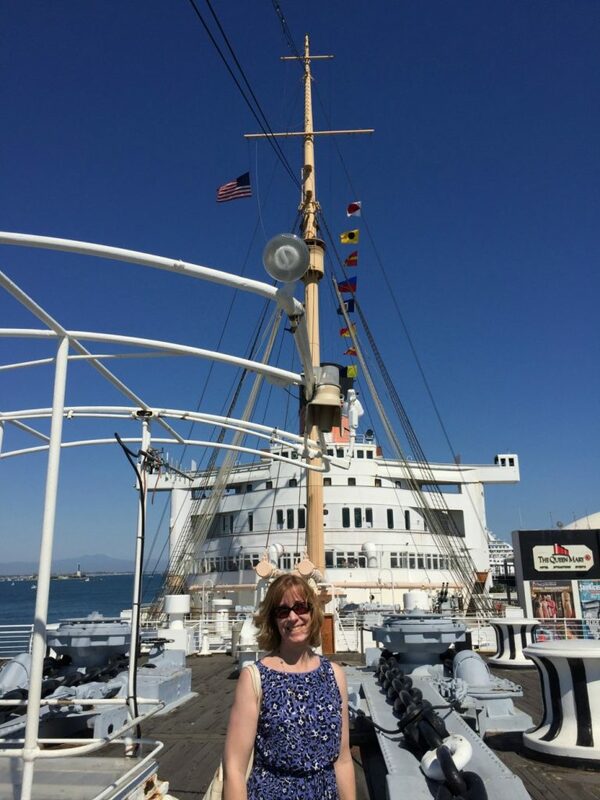 I toured the Queen Mary while researching this book. 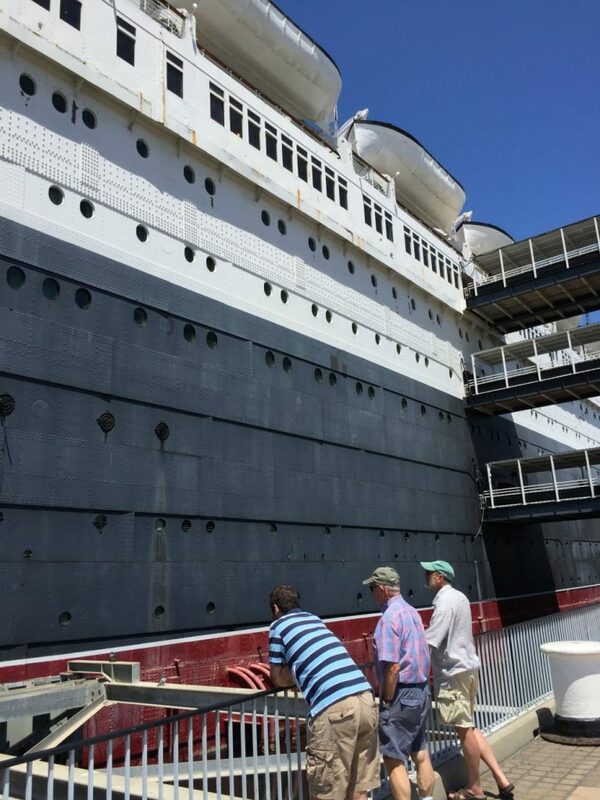 In addition to the self-guided tour, we took the “Glory Days” docent-guided tour focused on the history of the ship, which was exceptional! 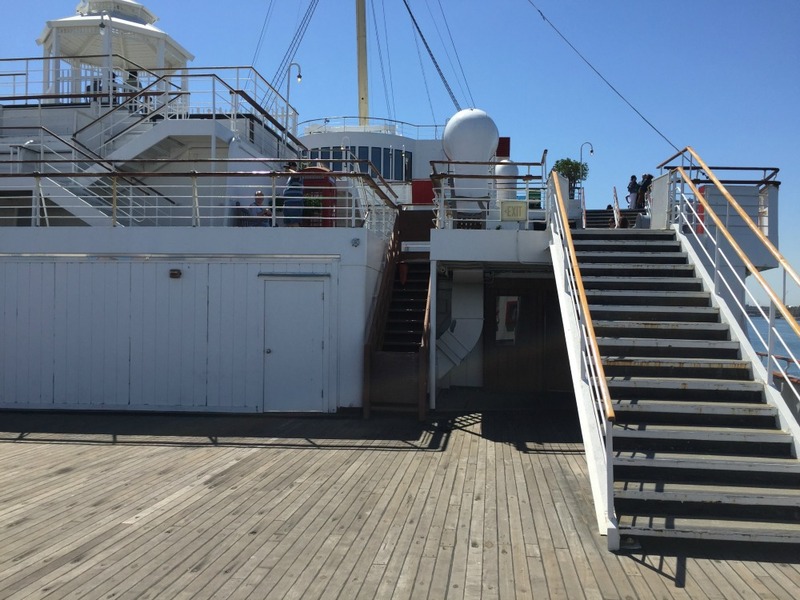 Today I’ll share some history of the “Queens” as well as photos from my tour of the Queen Mary. The RMS Queen Mary took her maiden voyage on May 27, 1936 with Cunard Lines. Passengers were able to cross the Atlantic in luxury in a matter of days—the record was in 3 days & 20 hours, a record that stood until 1952! Her sister ship the RMS Queen Elizabeth was launched on Sept. 27, 1938. 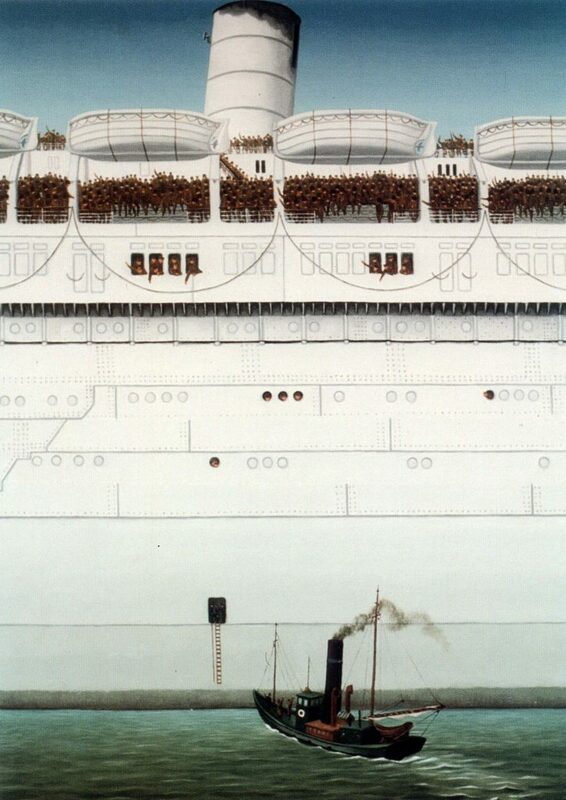 She was eleven feet longer, and with one fewer funnel, accommodated more passengers. When World War II broke out on Sept. 1, 1939, the Queen Mary was en route from England to New York—passengers included movie star Bob Hope. 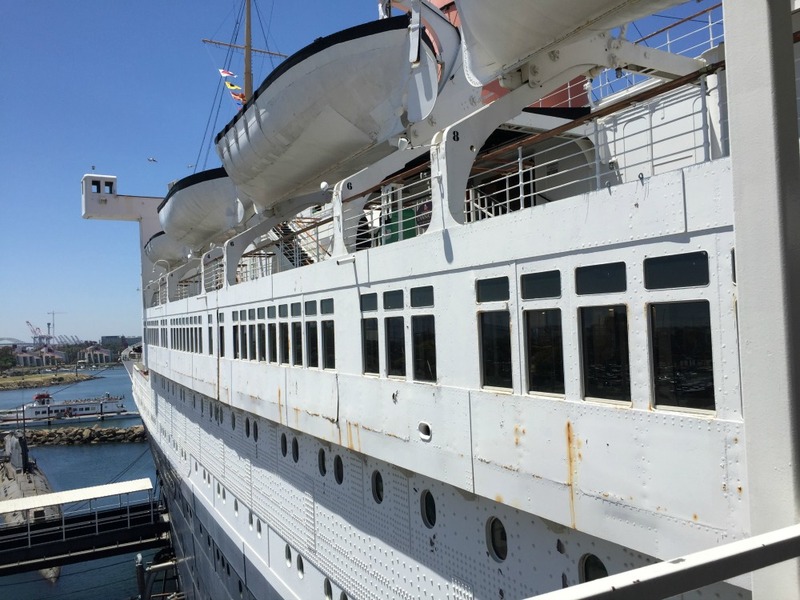 On September 2, the ship’s portholes were painted black for blackout conditions, and the ocean liner arrived safely in New York City on Sept. 4. The fitting-out process of the Queen Elizabeth was halted, and she didn’t receive her luxurious trappings until after the war. 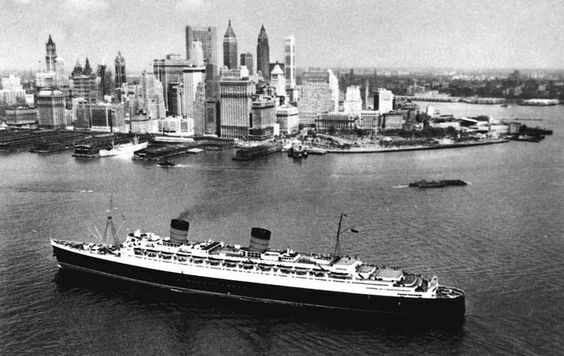 On March 21, 1940, she sailed to New York in great secrecy—including a ruse that she was en route to Southampton. The German Luftwaffe bombed Southampton that evening, believing the deception. 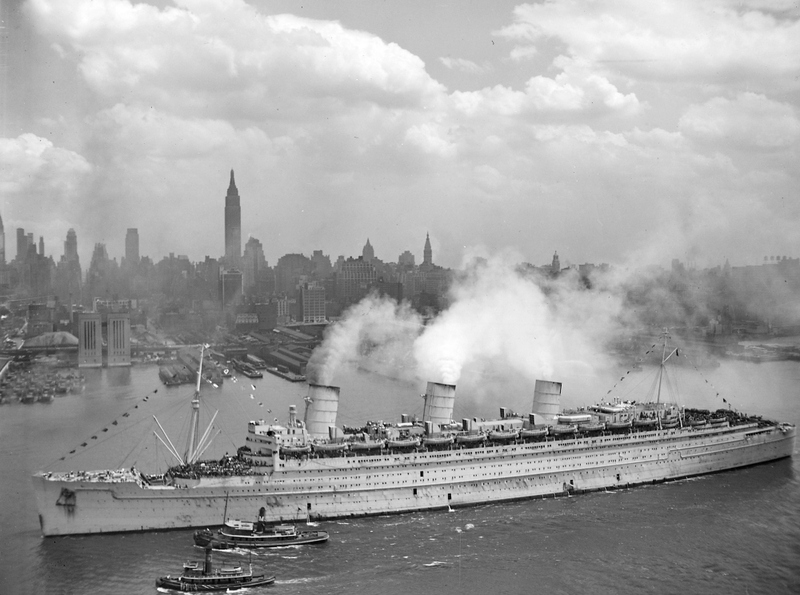 For several months, the two Queens, as well as French ocean liner Normandie, sat idle in New York. Britain requisitioned the two Queens and sent them to Australia and Singapore for refitting as troopships, and within a year, both were carrying large quantities of troops in decidedly un-luxurious settings. HMT (His Majesty’s Troopship) Queen Mary and HMT Queen Elizabeth each transported over 750,000 troops overseas during the war. With their high speeds (up to 30 knots), they were able to travel without warship escorts, because enemy submarines weren’t able to catch them. After the war, both transported servicemen—and war brides—back to the US and Canada. Shall we board? 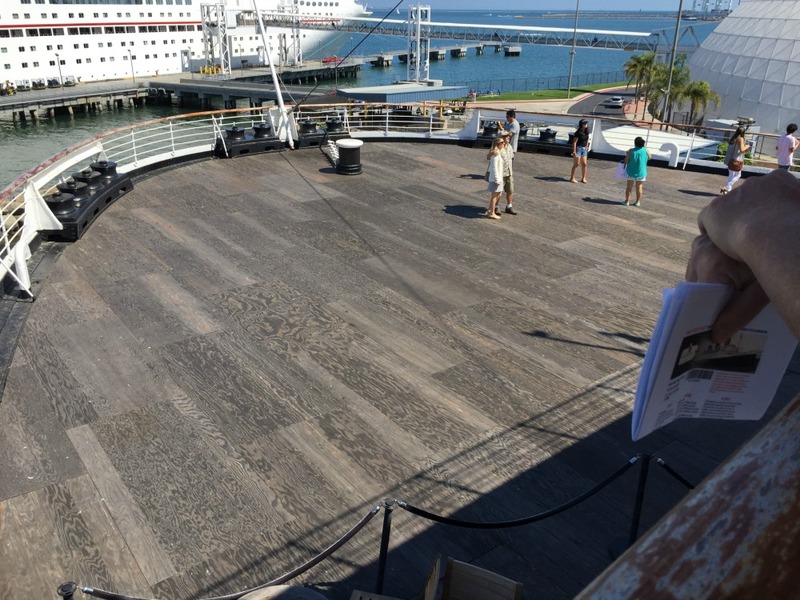 As we board the ship, we can see the set-up of the decks. 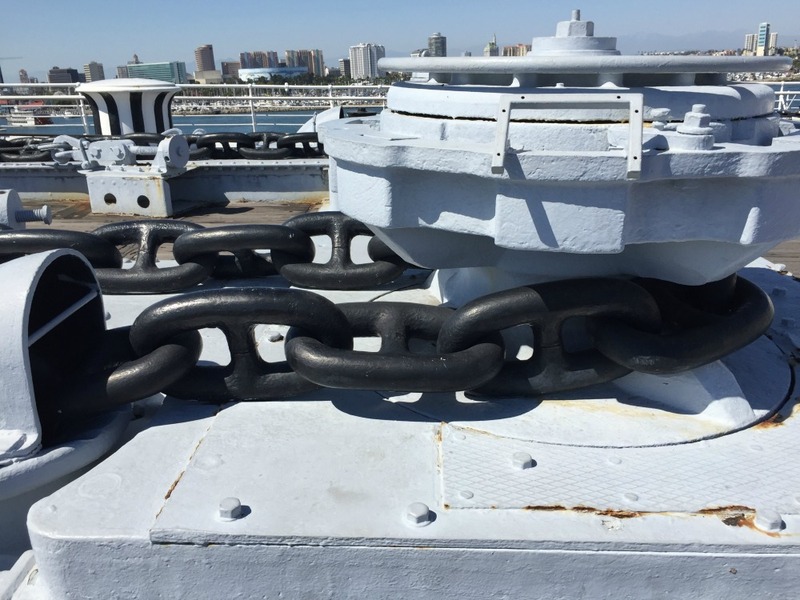 On the bow, the size of the anchor chain reminds us how very big this ship is. The ship also retains a 40-mm Bofors gun, which could be used to drive away enemy aircraft. 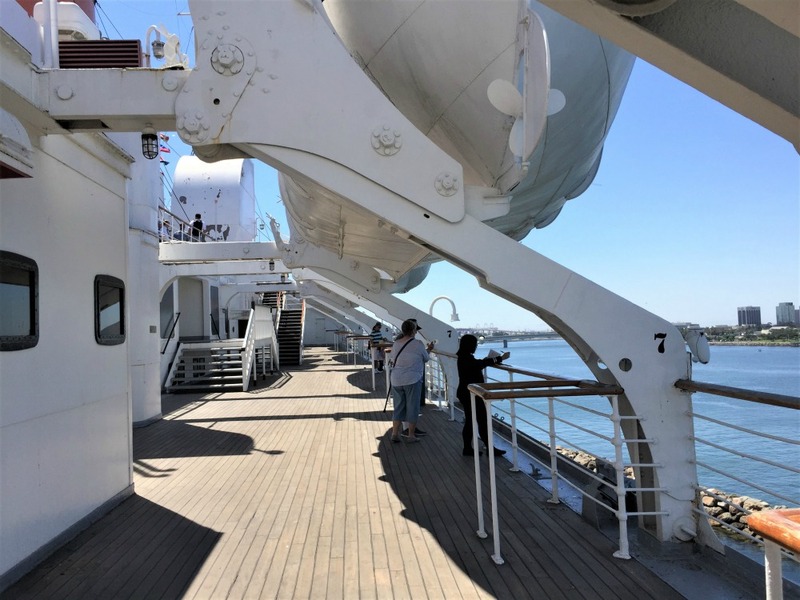 Boarding the Queen Mary – the sun deck (under the lifeboats), the promenade deck (rectangular windows), and main deck (round portholes). Let’s tour the decks, from the top down! 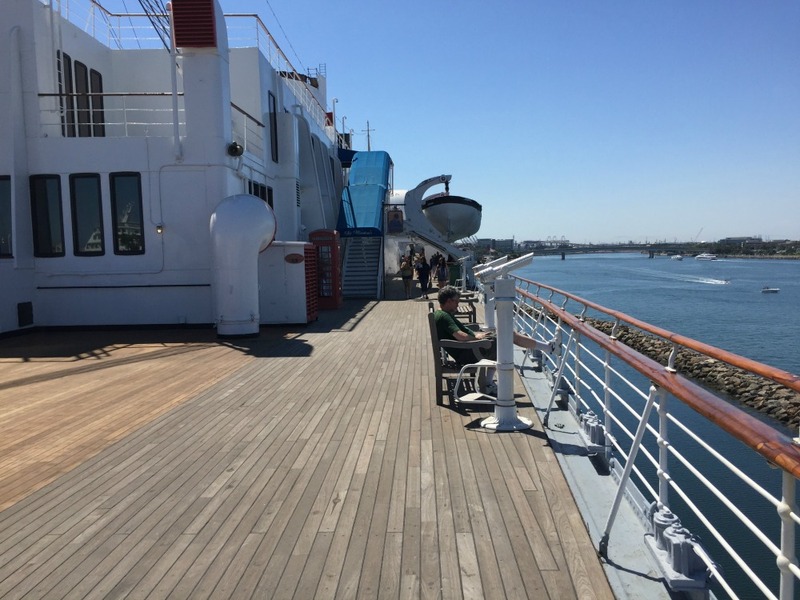 The sundeck was open to the fresh air—which was very bracing in the North Atlantic. 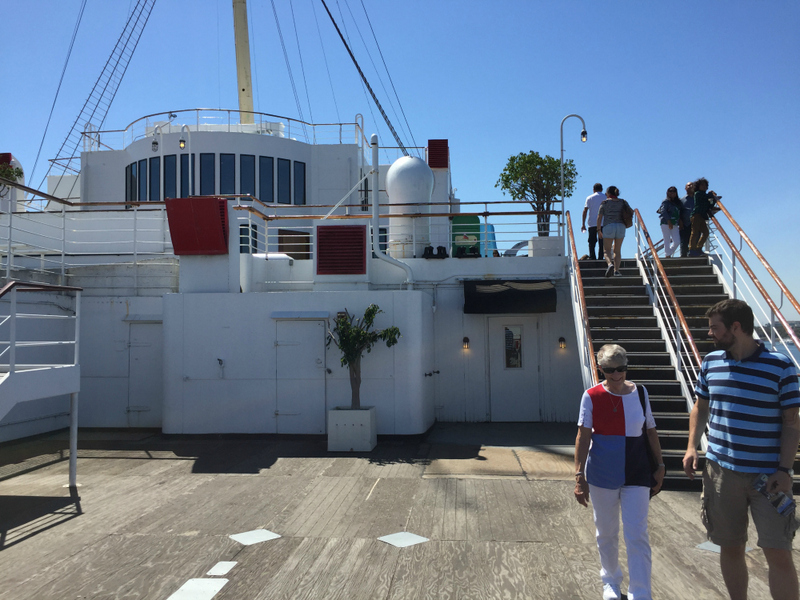 Next down was the promenade deck, which was covered. 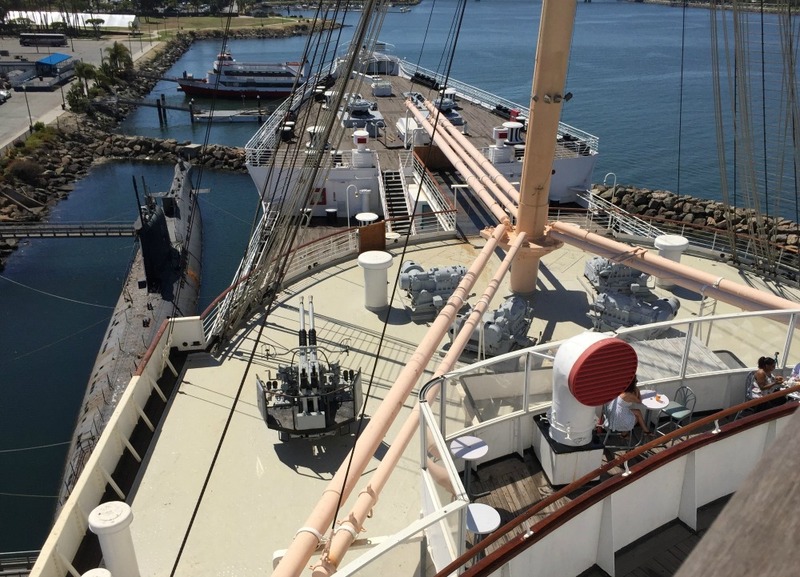 Both of these decks are amidships, which was “officers’ country” during the war. 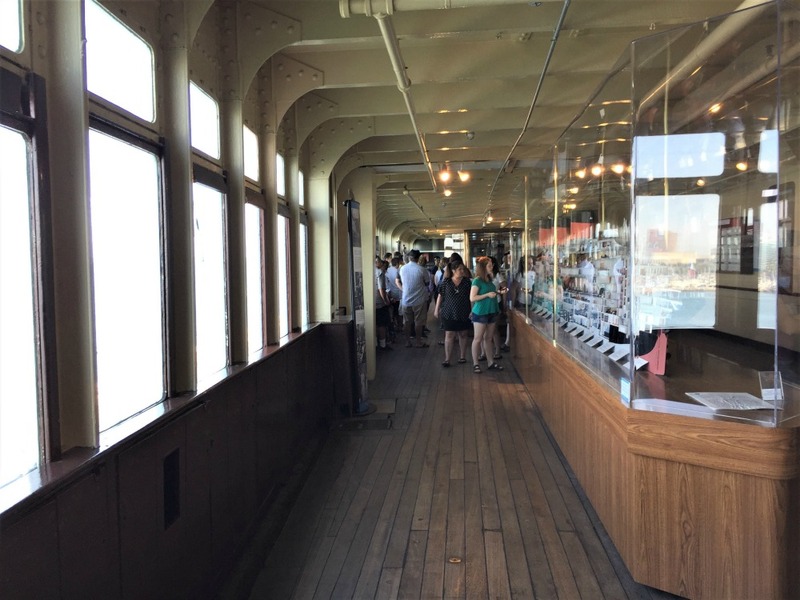 When enlisted men wanted fresh air, they were restricted to the main deck fore and aft. 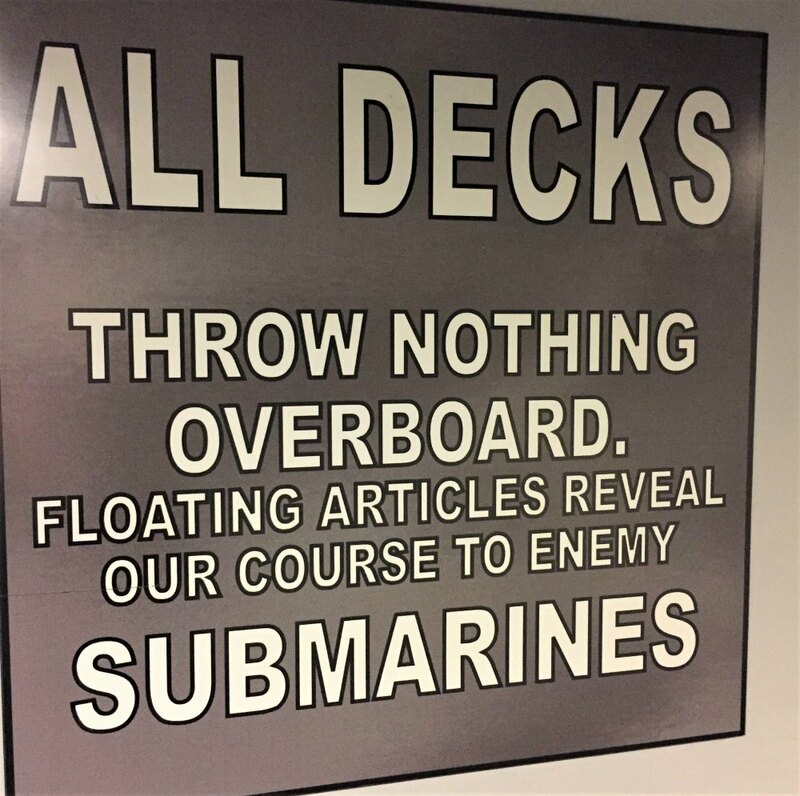 On boarding, each person received a colored card stating which section of the ship they were assigned to—and which shift for eating at the mess. Shall we go inside out of the icy air? Brr. Currently the Queen Mary is fitted out in her postwar ocean liner finery. 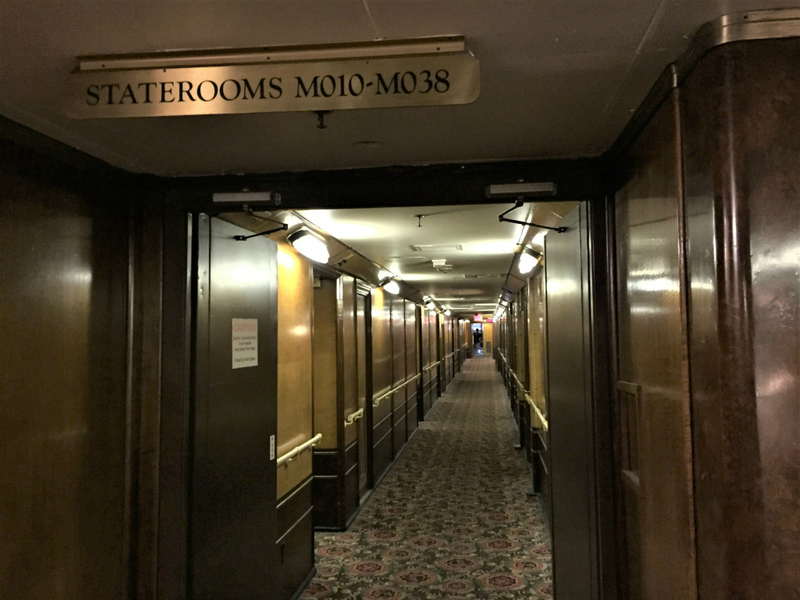 The opulence of the Royal Salon, the Observation Bar, the stairways, and the passageways by the staterooms give us a taste of what travel was like during the golden age of travel. 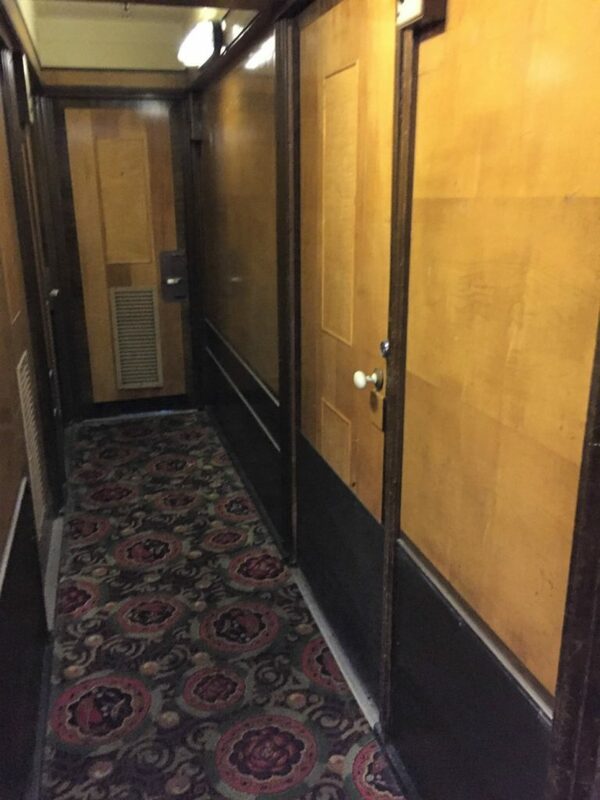 However, during the war, conditions were far less swanky. The Queens routinely carried 15,000 passengers and crew, with a historical record of 16,683 passengers in July 1943 on the Queen Mary. 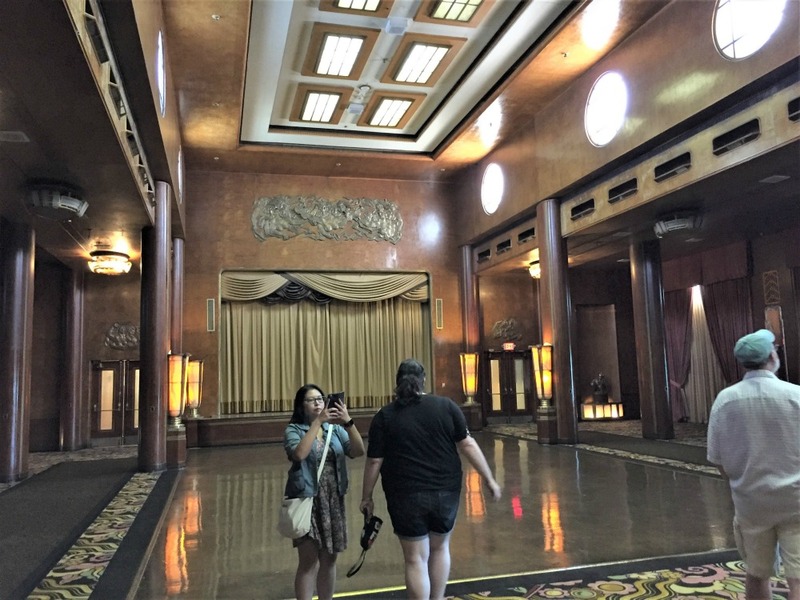 The fancy salons—and even the emptied swimming pool—were filled with cots in tiers three to seven cots high. Stories of the troopship crossings describe rough seas, unpleasant British cooking, and crowded conditions. The presence of signs as shown below reminded the troops that, despite the high speed, dangers remained. 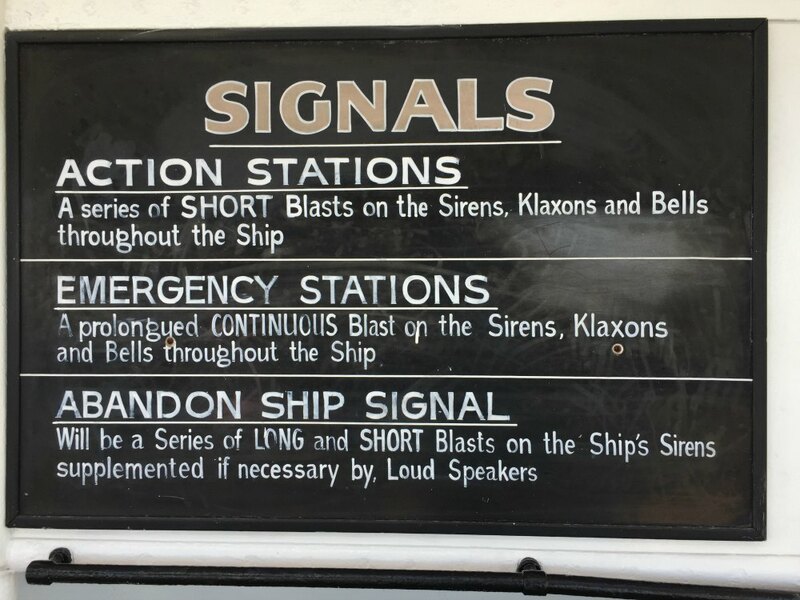 With lifeboat space for only 8000 passengers, these reminders were sobering. During World War II, the Queen Mary and Queen Elizabeth served the Allies as faithfully as any warship, carrying US and Canadian servicemen to England for D-day and beyond. 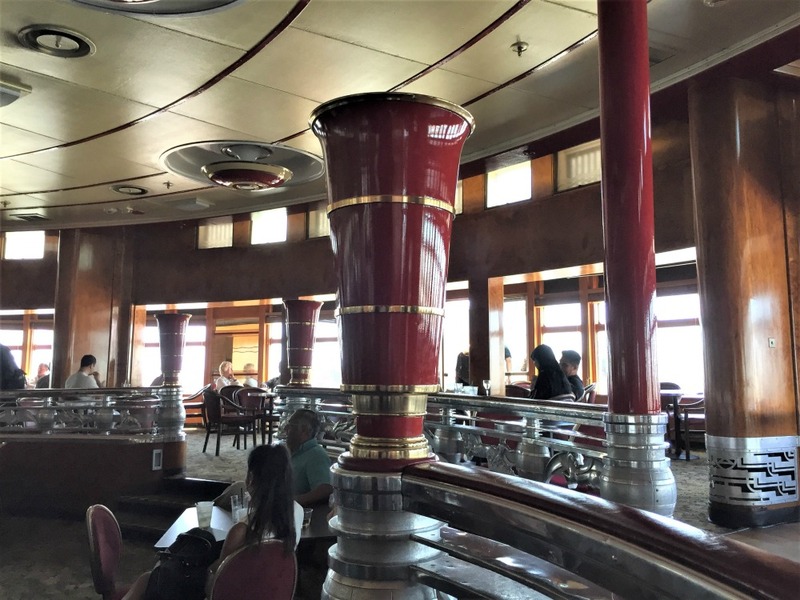 I hope you have the opportunity to visit the Queen Mary and imagine what life was like, both for the first-class passengers and for the crowded troops. Thank you for joining me! I hope you’ve enjoyed the photographs, the history behind them, and the connection to The Sky Above Us. 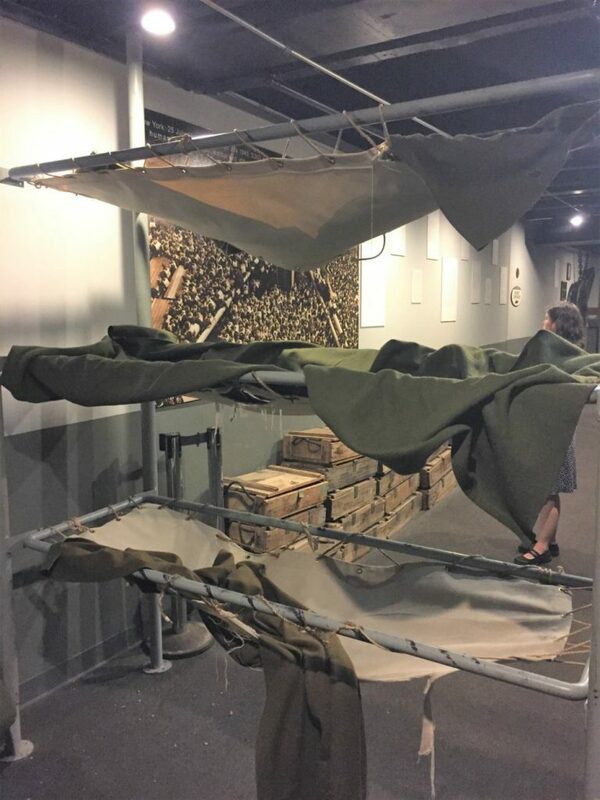 If you missed the photo tour for The Sea Before Us (2018), come see pictures of London, Southwick House, “D-Day at Sea,” and Omaha Beach. When The Land Beneath Us releases in early 2020, I’ll share the photos from England, Normandy, and Tennessee related to that story. 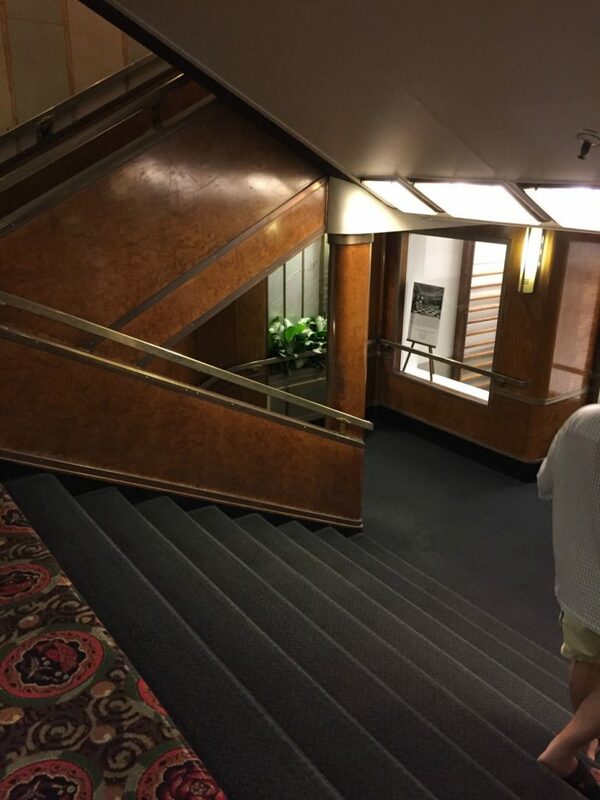 I visited the Queen Mary in 1977 and remember very little about it, just dark paneling. I had no idea it would appear in a book I would write decades later, or I would have taken lots of pictures. Another great presentation! 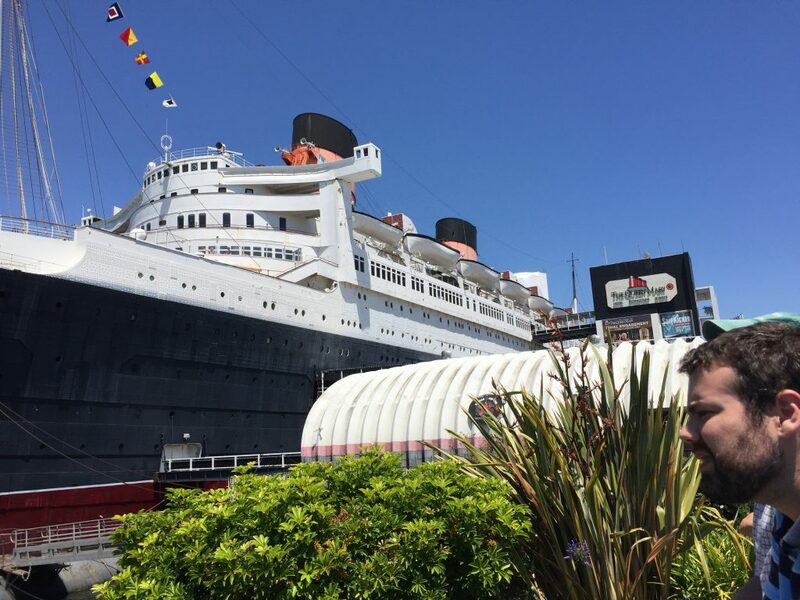 I feel as though I’ve toured the Queen Mary myself! Your photos and descriptions are exceptional. Thank you for these 4 special days of travel to better understand your novels and help us to appreciate our own history.